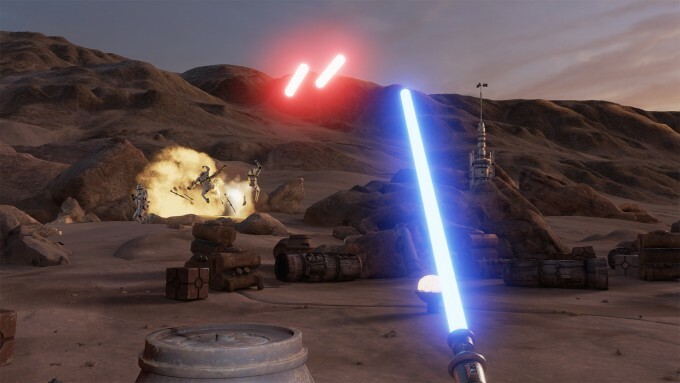 Lucasfilm has revealed a new HTC Vive experiment called Star Wars: Trials on Tatooine, which finally lets us wield the Jedi’s iconic lightsaber. Oh, and the Millennium Falcon makes a visit. 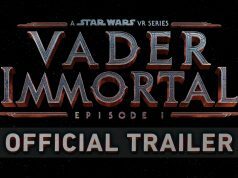 Over the years we’ve seen a number of fan-made virtual reality Star Wars creations, and each and every time it made me hopeful for the day when VR was big enough so companies like Lucasfilm would be making their own virtual reality experiences set within incredible universes like Star Wars. That day has come. 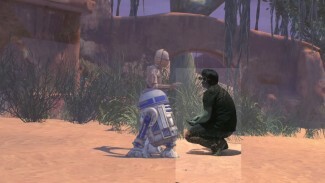 Lucasfilm launched ILMxLab with the express goal of reinventing storytelling through real-time media. 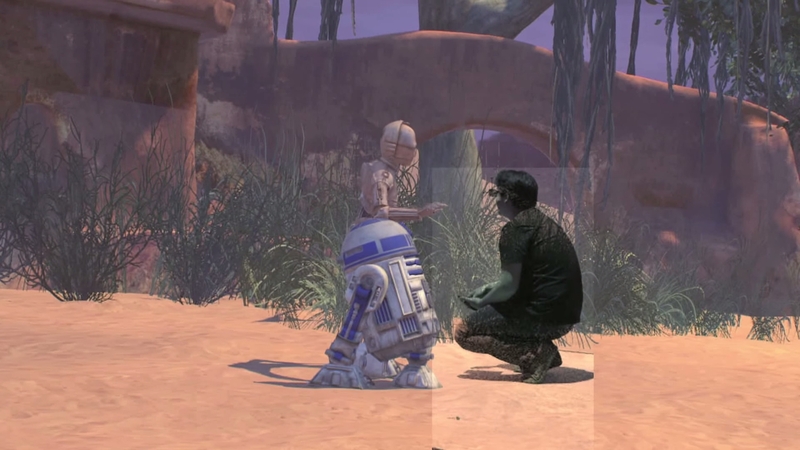 The lab has been experimenting with a range of immersive platforms, and has begun creating short experiences inside of Star War and other franchises to find out how best to utilize this new technology for storytelling. 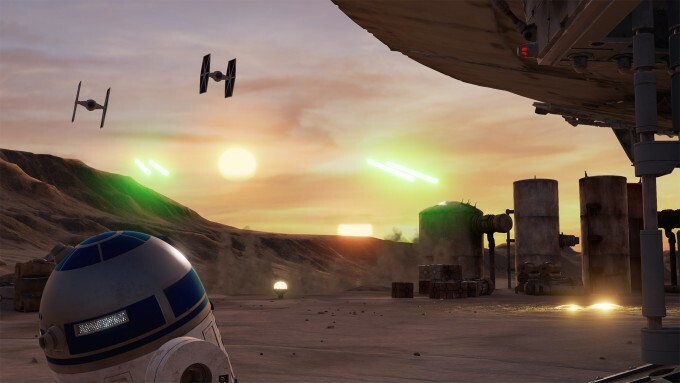 Their latest piece, which they call a “cinematic virtual reality experiment”, is Star Wars: Trials on Tatooine, is short experience made for the HTC Vive which explores interaction more so than we’ve seen from ILMxLab’s previous pieces. Trials of Tatooine begins, as you might expect, with the classic Star Wars theme and scrolling yellow text set against a starfield which eventually fades to a distant view of a sun peaking over the horizon of the planet of Tatooine. Once more, in classic Star Wars style, the Millennium Falcon makes a flyby right passed my view on its descent to the surface. Here I fade down to a desert landscape inhabiting the body of a Padawan who has been training on the planet. You can see the sun setting in front of you and in that same direction the Millenium Falcon comes into view. The ship approaches and comes in for a landing in the large opening before me. As it touches down, it lands so close that it actually towers over my head. Han Solo (not voiced by Harrison Ford, but by a fairly convincing stand-in) tells me he has a package to deliver, and down drops the ship’s ramp with R2D2 coming to greet me with its classic beeps and boops. At this point Han says there’s an incoming TIE fighter patrol and to the left I can see the crafts approaching from the same direction as the sunset. Their classic wailing engines gets louder as they come in fast for a strafing run, landing several blaster shots on the Millennium Falcon and several right near where I’m standing. The effects here were very well done and it was a pretty awesome sight, seeing explosive lasers being fired at the ship as the TIE fighters blasted overhead. Han asked me to look around for damage; I could see a panel now hanging loose from the Millennium Falcon with smoke and sparks shooting out. Not a good sign. The panel descended to about head-height, attached to a cylindrical strut, and from here I saw a handle which I was able to grab and pull it down the rest of the way down to the ground, revealing a mess of wires, components, and buttons. Han asked me to press a red button, which I did, but that didn’t seem to work. Then a green button, but that didn’t work either. At this point the wailing cry of the TIE fighters began building once again. Han told me in a panic to simply press every button on the panel. I tapped them all quickly, which apparently did the trick as the Millennium Falcon returned fire from its turret, destroying one of the TIE fighters and leaving the just intact enough to limp away. But that wasn’t the end of our troubles. Now it was time for an Imperial Transport to come make some trouble for us. 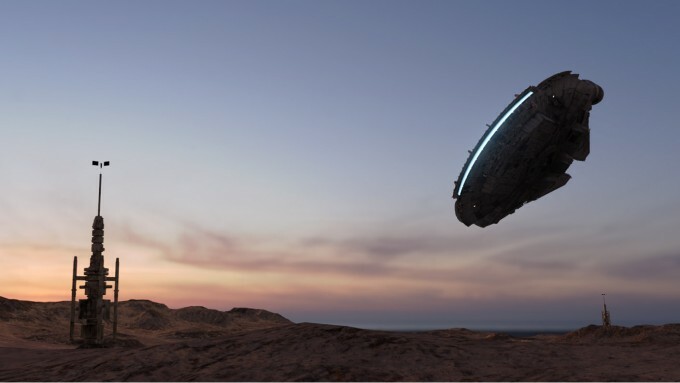 It flew in at high speed, set down several hundred yards away behind the cover of the rocky mountain environment, and unloaded a squad of Stormtroopers. R2D2 decided this was the right time to deliver my package: a lightsaber which raised up from the the droid’s fuselage. 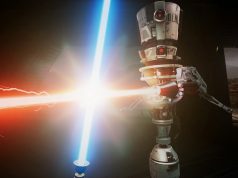 With the HTC Vive controller in hand, I grabbed the lightsaber as the Stormtroopers came within firing range, taking cover behind a series of boxes scattered in the space between us. 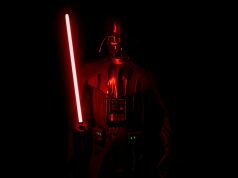 Pressing the Vive’s touchpad energised the blue lightsaber with the iconic sound of the movie, including that distinct hum as I waved the weapon about. As a Padawan, I wouldn’t have time to learn how to use it, but with Stormtroopers now leveling blasters at me, my education would come through trial by fire. I wasn’t actually close enough to swing at anyone, but I did know that I might have a chance to use the lightsaber to reflect the incoming blaster fire back at the enemies. I made the first few blocks successfully, but actually aiming the projectiles back at the enemy proved delightfully challenging. I figured it would be easy, but I had to build my technique slowly to orient my lightsaber just right for the lasers to reflect back and strike the Stormtroopers down one by one. And just like that, I had defended the Millennium Falcon from the incoming assault, leaving Han and Chewy to liftoff from the planet’s surface and head to their next adventure. At only about 10 minutes long, Star Wars: Trials on Tatooine was only a tease that left me wanting much, much more. If ILMxLab has their way, it sees likely we will get just that. The group says experiences like this are about learning what works and how to tell stories through immersive media like AR and VR, but their grand vision is to not only learn from such experiments, but to eventually create something that’s released widely for everyone to enjoy. Exactly what form that comes in, the lab isn’t saying just yet, but it’s clear that they’re heading in the right direction. 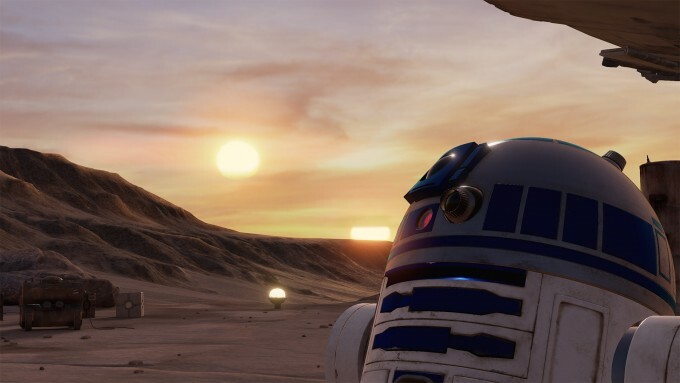 I would love more than anything to see a full Star Wars movie made from the ground up for VR. Can you imagine all the Easter Eggs?! Will this demo be available for everyone? They better be working on an x-wing demo.